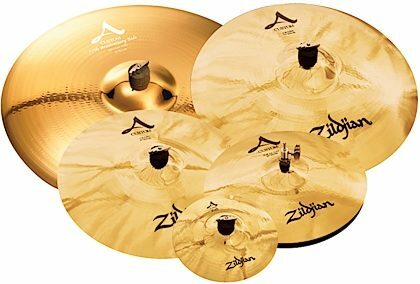 Zildjian A Custom Mastersounds feature the same crisp, rich and colorful sounds associated with the A Custom range, but featuring a bolder, clearer "chick" sound and full-bodied overall sound. A Custom cymbals deliver a sophisticated expression of classic Zildjian A Series sounds. They feature thinner weights and radically innovative hammering. - Selective: Concentrates on an exlusive range of sounds drawn from the A Zildjian palette. - Distinctive: Radical rotary hammering techniques, exclusive to Zildjian, and special thin weights create a sophisticated sound quality reminiscent of cymbals from the forties and fifties. - Modern: Enables contemporary drummers to add classic A sounds to today's music. - Unique: Every cymbal is individually cast and rolled from the secret Zildjian alloy, creating instruments that each have a distict voice and character. Overall: I have tried all types of cymbals. And these are the best I've played. Let me start by saying they look amazing. The high hats are the best sounding I've ever heard. A distinct chick, and the perfect amount of slosh. The crashes come alive, not to explosive, just the right amount of shimmer and decay. My only issue with the crashes is, my set came with 17" and 19" crashes so they can be a little to loud and take to long to decay. But I'm going to get a matching 14" to take care of it. The 10" splash is bright and quick. The 21" ride was my least favorite at first. Because of the size it took a bit to get it rolling. I switched to a heavier tipped stick and it came alive. Now it's my favorite of the pack. The bell has the best ping and the wash doesn't overpower stick articulation. I opted for the 18" China and by itself it sounds great. But when played in a band setting it is perfectly trashy.